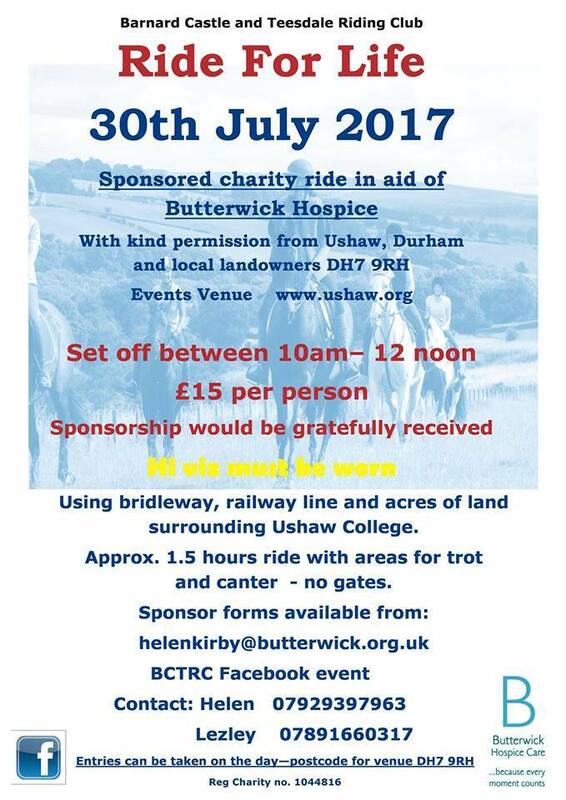 Using bridleway, railway line and acres of land surrounding Ushaw College. Approx. 1.5 hours ride with areas for trot and canter - no gates. RIDE FOR LIFE 2015 AT WHITWORTH HALL ESTATE SUNDAY 26 JULY. Approx 8 miles plus Clear Round Show Jumping. UPDATE: The Ride for Life 2013 was a great success and on the day we had 78 happy riders on the course and many of them tried their hand at Clear Round to boulster the fund for Macmillan and the Butterwick. We had positive feedback regarding the course and the venue owners, Witton Castle Country Park, Mr Stelling and Mr Thompson, assisted us by moving stock, barriers and filling in washed out paths - a Huge thank you to them from us all. The memory tree filled up and putting on my messages to my family and friends lost to cancer made all the effort put into the day even more worthwhile. We raised £1224.34 and there is more to come in. I'll keep you updated and post the revised figure as it goes up. 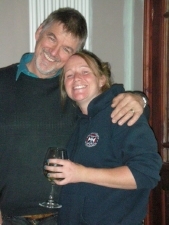 In memory of Jayne Reid died 13 September 2012, age 27 R.I.P. By Kind Permission of Witton Castle Country Park, Mr Thompson and Mr Stelling. The morning dawned overcast but dry as horses were loaded ready for the journey to Frosterley. Some encountered drizzle en route but luckily the breeze kept it at bay. 40 riders in total came and enjoyed the ride across old land which was not affected by the recent rain and provided excellent going. Not one bit of road work makes a real change for most of us with the added bonus of a round of show jumps. £800 has been raised and will be donated in full to Macmillan Cancer Support and Help for Heroes. Many thanks to Mr & Mrs Reed for allowing us the use of their land, Mr & Mrs Reed (snr) for admin and parking, Andy for marking the route, Kimberley for running the Clear Round, the Reed extended family and friends for their support in so many ways (sorry for not naming you all but you do know who you are) and lastly the riders who helped us raise the much needed cash for 2 worthy causes. We had a smaller than usual turnout for the Ride for Life this year but they weather was kind to us and everyone really enjoyed the ride around Houghall Campus. 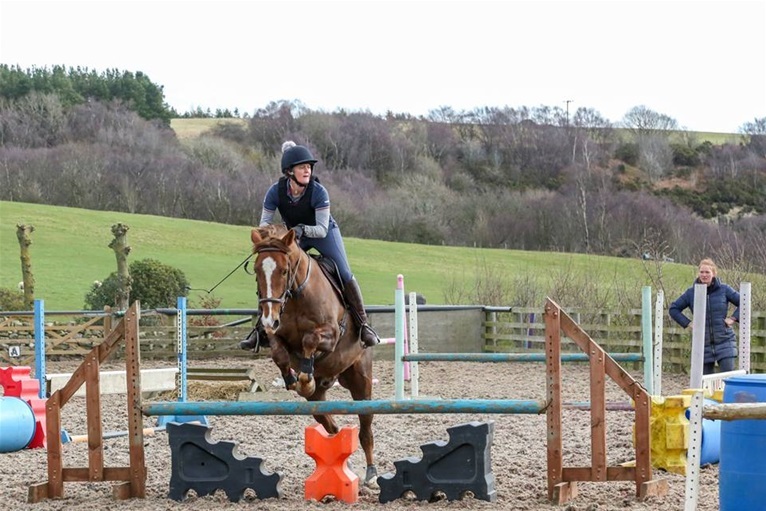 Most riders took the opportunity to jump the X country fences and entered the Clear Round in the arena. So far we have raised approximately £900 for Macmillan Cancer Support. May I take this opportunity to thank Chloe for plotting the course and doing everything I should have done but didn't because of my mishap, to my friends from Cyprus who came for a reuinion and ended up acting as stewards on the day, Jan for her admin skills booking riders in and out, Alan for taking more super photo's, Michelle, from Macmillan for coming along to support us, and East Durham College for allowing us to use their facilities. £550 was raised by 31 riders who came along to support the ride. Everyone enjoyed the opportunity to canter through open fields and take in fantastic views over the slower sections in the knowledge that they were raising much needed cash for charity. It is a priviledge to have access to this land and I would like to thank the Reed family, en mass, as they all turn out to help, Peter Fawcett, head keeper for Bollihope Estate, and Andy who, as ever, did a sterling job marking the route (even I didn't go wrong!!!) for their continuing support in this our 3rd year . The day started warm and bright and as I pulled onto the field I was filled with fear and dread once more - would anyone turn up? Would we raise money? Would people enjoy the enjoy the ride? As ever trailers began driving onto the field and riders queued to register and pay. Unlike last year I was riding the course and at 10am prompt myself, Hannah, Sarah and Jennifer Bottomley, Sophie Barton and Nikki Grundy set off. After the first field we did a quick girth check and set off at a steady canter until I saw the first directional arrow - up the hill girls I cried and off we went at full pelt. On reaching the top and a high dry stone wall I realised I had gone wrong so we strolled back down the hill and through the gate picking up pace and enjoyed a long canter almost to the top of the fell. The going along the fell road was admittedly a tad rough but nothing that our horses couldn''t cope with and Nikki, Hannah and I walked on briskly leaving Sophie, Sarah and Jennifer bringing up the rear. It was a long walk but the scenery was beautiful and we chatted as we went. Though a gate, manned by a member of Hannahs'' family, and we were back on good going so we picked up canter again and made the most of it. Onto the road section then back into fields for yet more canters finally reaching West Biggins, down the lane to Broadwood and the trailer. It was a fantasic ride, which I for one, thoroughly enjoyed and it was made all the nicer knowing we had done something so enjoyable and were raising funds for the Great North Air Ambulance and the Rainbow Trust to boot. I stayed on the field to see all the riders home and everyone, without exception, enjoyed the day. I would like to thank the landowners for giving us access, Catherine Reed and her family for the organisation, to Andy for the excellent signage, (despite me going wrong so early on the course!!) to the girls who took names and handed out the rosettes and to Hannahs'' family who came and supported the event by manning gates and just being there. Entries and donations came to the grand total of £1149. Well done to everyone and see you all next year. Click link below to see photo''s availible to purchase @ £2.50 as an email attachment or £5 per print. Contact Lezley 07891660317 or email laldrich@hanseuk.co.uk to place an order. We rode and raised money in memory of a special little girl, Hannah R.I.P. It was a very wet start to the Ride for Hannah on Sunday, 17 August, but undeterred the markers were put out and the admin trailers positioned ready to register riders. As the rain lashed down the first trailer pulled onto the field and our spirits rose. Horses and riders began to arrive in a steady stream and bedecked in Pink they braved the weather and set off. We had 38 take part and they all returned safely with the exception of one who took a tumble, completed the ride, but came back sporting a gash to her nose and a black eye. She left the field driven by her husband donning an icepack and still managed a smile (We all hope you are not feeling too worse for wear today-take care). Luckily the weather had cleared by the time the first riders returned and those who set off later enjoyed clear skies and sunshine. We were all cheered by the positive comments from the riders and the smiles on their return - it made all the ''behind the scenes'' work all the more worth while. Hannah''s family came along and supported us during the whole ride and were absolutely delighted at the response. As of today, Monday 18 August, £1474.45 has been raised and hope the figure increases by the end of the week when the final sponsor money is collected. It will be donated, in its entirety, to the Rainbow Trust who support terminally ill children and their families. I would like to thank everyone who helped on the day especially to Catherine, who told us about Hannah, checked the route, supplied the field for parking (and had a tractor on hand to pull anyone out, but luckily it was not needed! ), not to mention the buffet she and her family provided for the helpers, to Andy, who organised the signage and things too numerous to mention! to Catherines mother-in-law who sold raffle tickets, to the girls who helped check in the riders and hand out the rosettes as they returned (sorry kids I have forgotten all your names but you know who you are) to the farrier who stepped in to pop a lost shoe back on and to the many others who supported thoughout the day. Without all of you non of this would be possible THANK YOU. Our Chairman, Lezley Aldrich, organised the Ride for Life held at Raby Castle, Saindrop, by kind permission of Lord Barnard on Sunday May 11 to raise money for Macmillan Cancer Support. After many months of planning the day finally arrived and begun bright and early for her and her band of willing volunteers. In the early moring sun the admisintration trailers were organised, signage put up and stewards sent to their posts and last minute ''bits and bobs'' seen to. We waited with baited breath for the arrival of the first entrants and at 9.30am in drove the first trailer followed by another and another and another......... we were amazed; it was a convoy of transport of all shapes and sizes bringing 212 horses in all, within the 2 hour set off period. The field was filled with trailers and boxes, shining horses and ponies of all shapes and sizes and happy riders eager to set off. At 10am riders young and old set off in the sunshine to enjoy a 10,or 3, mile route through woods, open fields and Raby Park with the Castle as a backdrop. The whole day went without a hitch and on their return riders were eager to come to express their thanks and let us know how much they had enjoyed the experience of riding in such beautiful, tranquil and safe surroundings. Lord Barnard for the venue, given free of charge, it was a priviledge to be allowed to ride in the Park, Katie Blundell, Raby Marketing Manager, Iain Alexander, Raby Estates who helped plan the route, Jo-Ann Evans, Macmillan Cancer Support, Lightening Signs and Mickleton Service Station for the signage, Atkinson Joiners for the waymarkers, and HanseUKMarine Consultants for sponsoring the rosettes. To Matthew Dent who worked tirelessly throughout the day running errands and handing out refreshments, to the band of volunteers, made up of family, friends, colleagues and BCTRC members, who gave up their Sunday to help and finally to the 212 riders and their family and friends who attended on the day, and everyone who sponsored us and helped raise much needed funds for Macmillan Cancer Support. On Monday, 23 June a cheque for £4210.92 was presented to Jo-Ann Evans, Macmillan Cancer Support, at the gates of Raby Castle by Lezley Aldrich and Viv Dent, supported by Katie Blundell, Raby Castle. We plan to make our ''Ride for Life'' and annual event and take the idea around country. Up to date 19 Riding Clubs are taking the proposal to committee and, if accepted, will host a ''Ride for Life'' in their area. A website is being constructed and information posted. Watch this space.